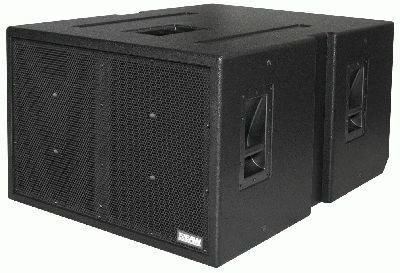 EAW®, a world leader in audio system solutions, announces the launch of the SB2001 Subwoofer. The dual 21-inch cone driver represents a very noteworthy upgrade to the SB1001 in terms of output capability and low frequency extension (17% larger voice coils, 59% greater Xmax and more than double the volume of air displaced) without a significant increase in size. The stunning result is a new and more powerful workhorse that has greater impact, power handling and output capability than its celebrated brethren. The unique driver mounting of the SB2001 maximizes cone area and allows for the integration of an extremely low turbulence port while minimizing frontal area, providing the acoustical performance and physical configuration well suited for creating large subwoofer arrays. This benefit is largely derived from the unique V-shaped baffle loading of the transducers. The nearly opposing devices force all of their combined output through an opening that is somewhat smaller than their collective cone size. This compression of energy through a smaller aperture results in phenomenal impact and rewarding growl. The enclosure design integrates 3/8-16 suspension points for installation applications and is fully prepped and ready to receive the user installable quick release rigging kit accessory for touring applications. The SB2001 is noted for its tremendous punch given its small size (33.5" W x 22.63” H x 45.0” D; weight: 200 lbs) and is perfectly suited for a wide range of applications including concert touring, arenas, houses of worship, large auditoriums, theaters and large dance clubs. As always, optimized processor settings for the UX8800 Digital Signal Processor are available for download on the EAW website. The EAW SB2001 Large-Format Dual-21-Inch-Loaded Subwoofer is now shipping worldwide.